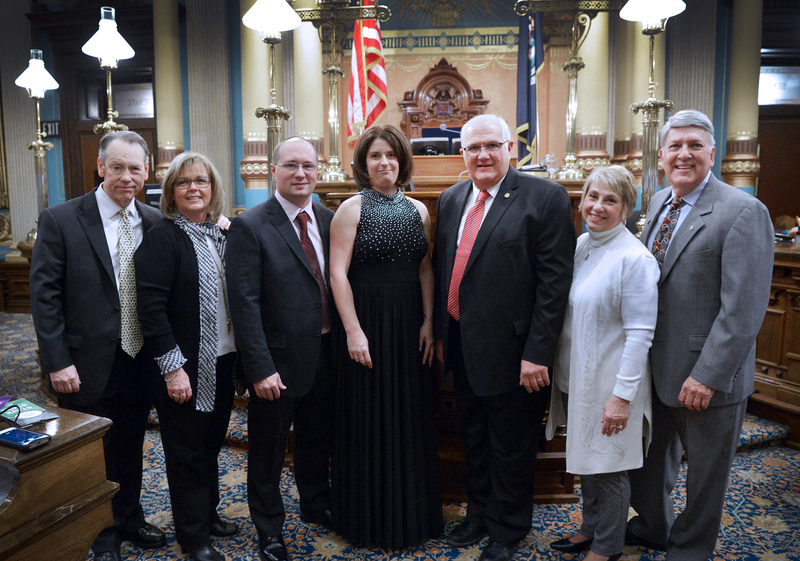 LANSING, Mich. — Sen. Dale Zorn, R-Ida, welcomed Meridian Mechatronics President Kevin Iott and his wife Laura to the Michigan Capitol on Tuesday night. Iott was Zorn’s guest for Gov. Rick Snyder’s 2018 State of the State address. Meridian Mechatronics is based in Deerfield and manufactures commercial ground-based telescopes used by consumers, schools and research institutes. Joining the Iotts with Zorn were Tom and Mary-Louise Allen, Zorn’s wife Cindy and Bruce Diven. Editor’s note: The above photograph of Zorn is available by clicking on the image or by visiting the senator’s website at www.SenatorDaleZorn.com/Photowire.